Hands up if you use your fingers to apply your foundation. I used to too, but when I met my now best friend, who’s also a beauty blogger, she quickly set me straight. Makeup brushes are key for proper application, and now that I’ve switched over I can’t imagine life without one. As a makeup minimalist, little did I know there were different brushes for everything, from concealer brushes, to eyebrow brushes, contour brushes, and more. Needless to say, it was an exciting new world, but it definitely added up. That’s why for this post we decided to round up the best drugstore makeup brushes so you can apply your makeup flawlessly without breaking the bank. The best cheap makeup brush sets are far from low quality. The handles are made with materials like bamboo for long-lasting quality and synthetic bristles that are hypoallergenic and easy to clean. Cleaning your brushes is so important. Many people miss this skincare step, but a lot of bacteria and dirt can start to build up in your brushes and that’s the last thing you want transferred to your face. There’s something about using cosmetic brush sets that makes you feel so lavish. I love using different brushes to apply my liquid and powder foundation, bronzer, blush, highlighter, eye shadow and brow powder. It makes makeup fun and more interesting to me. Brushes can help transform your look and using the right brushes is key to creating the makeup look you want. The best foundation brushes, eye brushes and cheek brushes will help you go from looking like a beginner to pro in no time. Take a look at 9 affordable brush kits to invest in. If you’re looking for affordable quality makeup brushes that will last, this set is made with natural bamboo, which won’t scratch or wear. With synthetic fibers, the brushes are fully vegan, antibacterial and hypoallergenic. They’re handmade and work with liquids, powders and creams to ensure flawless application. You get eye makeup brushes, a foundation brush, a powder brush, a concealer brush and a contour brush in this kit- everything you need for daily use! These brushes are great if you have sensitive skin. Some brushes have a tendency to break you out, so it’s best to do your research. This set of makeup brushes is handmade with synthetic fibers for precise, beautiful application. They’re extremely soft and easy to hold which makes applying makeup hassle-free. Not only does it come with foundation and eye brushes, it also comes with a lip brush for seamless lipstick/gloss application. With this brush set, you also get a multi-functional beauty sponge and a brush cleaner. Cleaning your brushes regularly will keep dirt and bacteria from filling up your pores. Since I wear liquid foundation, I wash my foundation brush every single day. For powder products, make sure you’re washing them at least once a week. One of the amazing things about these brushes is that you’ll get incredible control when you do anything from blending to contouring. Quality affordable brush sets like this one aren’t easy to come by. These brushes feature ergonomic wooden handles that are optimized for holding and blending fine cosmetics. The set also has some of the best unique shape brushes to enhance your facial features. The bristles won’t shed and your makeup will go on smoother than ever. This brush set is awesome because it was designed exclusively by major beauty industry leaders. They’re smooth and make it easy to apply everything from foundation to blush to eyeliner. They’re made from high-end performance alloy, wood and soft synthetic to ensure they last. With an electric toothbrush shape, these brushes are so unique and look totally trendy. I love how the colours make them look so elegant, so you can feel luxe while applying your makeup. They’re compatible with any type of foundation and powder, and are densely packed for streak-free, flawless coverage. Packaged in a cute, shiny travel bag, this brush set is pretty and unique. Made with high-tech materials, it makes it easy to get the airbrushed look you crave. With a silky feel, the synthetic bristles are durable and easier to clean than natural hair. The gold mixed with wood gives the brushes a high class feel at a fraction of the cost. This set is filled with brushes for eyeshadow and eye makeup only. The bristles are vegan synthetic fiber and are the perfect density for packing color, plus smudging, buffing, blending, defining and highlighting. The handles are scratch resistant and made to last, and the bristles won’t shed. If you want to enhance your eyes from day to night, using quality brushes makes it so much easier to get the look you want. Any beauty lover needs this brush set in their makeup bag. The glistening rainbow handles are totally dreamy and the pink brush tips are ideal for any girly girl. The entire brush is vegan, with synthetic fibers that feel soft against the skin. The right makeup brushes make a huge difference to your entire look, but you don’t have to break the bank to get a quality brush set. These are the best drugstore makeup brushes to invest in. Which ones suit your makeup bag? 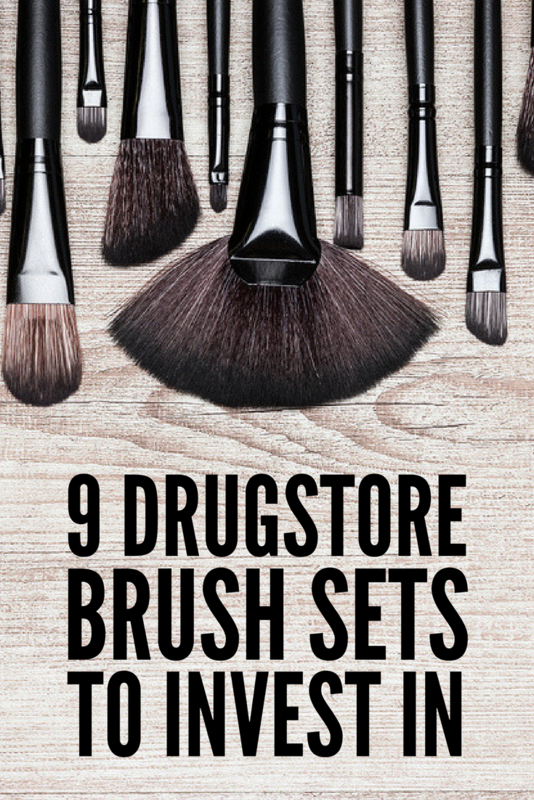 If you liked this list of the best drugstore makeup brushes, please share it on Pinterest! And if you’re looking for more great makeup finds, please follow our Beauty board on Pinterest!